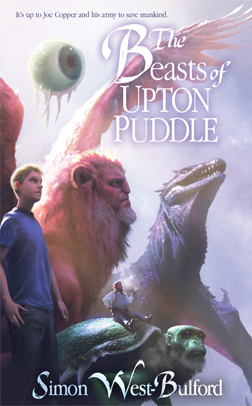 Action, adventure, a hero and a bad guy, just about everything that you hope to find in a young adult novel, and that’s exactly what you’ll find in The Beasts of Upton Puddle. One thing I liked about this story was Joe seemed like your average boy. He’s being bullied, his life seems perfectly normal, but then his given this huge task of saving mankind. The author did a great job not making him too perfect because at times you wonder if he can pull off what seems the impossible. The secondary characters are great too and I really like the somewhat eccentric Mrs. Merrynether. However, what really won me over was the wonderful creatures the author had created and his description of them. They seemed to come to life off the page. The dialogue is natural sounding too, and despite this being 487 pages long, the pacing is somewhat fast due to the non-stop action of the plot. If you’re looking for something a little different to read for yourself, or if your offspring enjoys fantasy novels, this might be a good pick for you or them.